Cute, Cool and Fun Beds for Toddlers! You won’t believe these cool beds for toddlers! Buying your growing toddler a fun bed is the best way to keep him or her in his bedroom at night! They are going to be so excited with their new fun toddler bed that they will be thrilled for bed time! Here you are going to find the most fun beds for toddlers around! 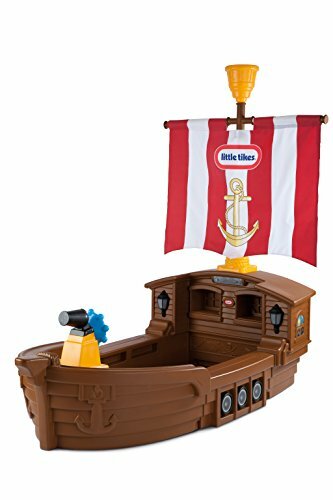 *This Little Tikes Pirate Ship bed is by far one of the coolest beds for toddler boys ever created! Just imagine your 2 year old going to his very own ‘pirate ship’ boat shaped bed every night! I had so much fun finding these I wish I could have a cute bed too! Best Car Shape Beds for Toddlers! 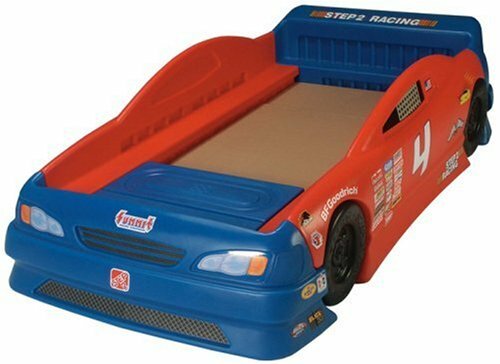 Race car beds make the best beds for toddler boys! They absolutely love car shaped beds! This is an awesome and very cheap car shaped bed for your toddler! It is very spacious and lots of fun! The bright colors are awesome and will make your son’s bedroom look very cool! If you have more than one boy, even better! You can pass this bed on from boy to boy, since it is extremely durable! *Very Cool Car Shape Convertible Bed for Toddler Boys! 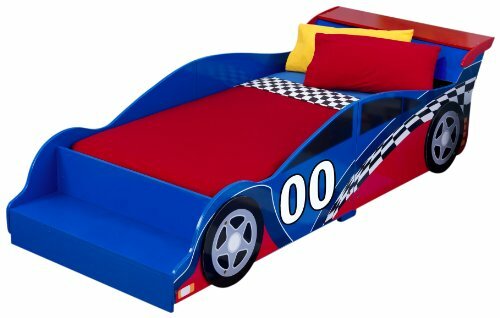 Another fun and very colorful race car toddler bed for boys! What parents most love about this bed is that it will fit both crib or a twin-sized mattress! 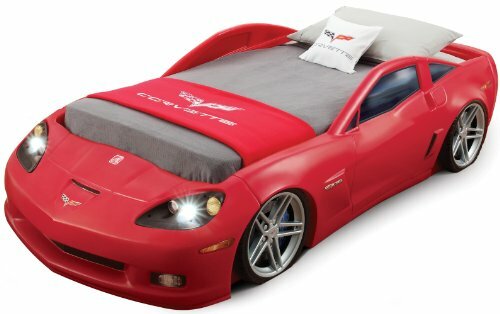 Can you imagine your toddler boy sleeping on this awesome red Corvette bed? It looks just like a real adult car doesn’t it? It is one of the most bought car beds for kids! It is big enough to fit not only toddlers and kids ages 2 and 3, but also bigger kids as well! It is also very sturdy and durable, so you can definitely pass it down to the younger ones! Happy buyers say their kids love it!! Specially because of the lights! Bed time has never been more fun! What a wonderful and creative gift idea for little boys! I can almost hear the car engine! *This little boy LOVES his new red Corvette bed! Of course I wish I had one too! The best beds for toddlers need to be a lot of fun! This is one of the most gorgeous pink car shape bed for toddler girls I have ever seen! 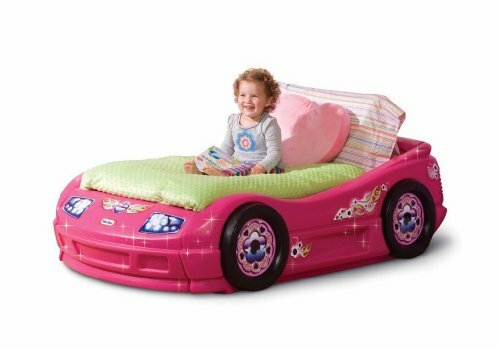 Toddler girls like car shape beds too! Getting your little girl to sleep in her own bed will be a breeze when she gets this awesome pink bed! That 2 year old girl in the picture is definitely not complaining! 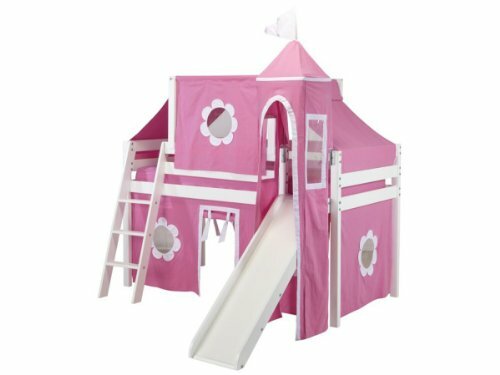 It’s a Pink Princess Castle Bed for Toddler Girls! Because every little girl is born a princess, of course your little girl deserves her very own princess bed! Just imagine the look on your little girl’s face when she sees this beautiful pink palace bed! The headboard also comes with a ‘magical window’ with a gorgeous scenic ‘view’ outside of her pink castle! One of the best beds for toddler girls! 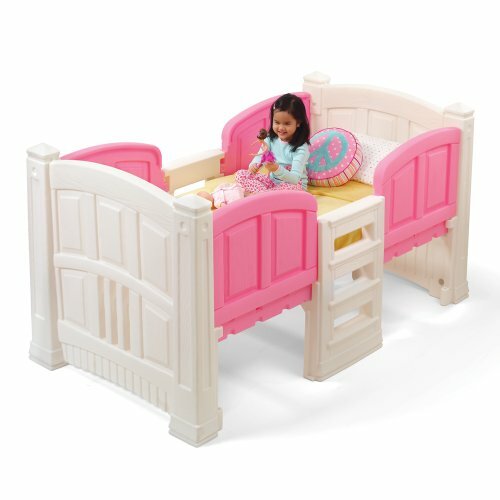 Very Cute Toddler Girl Twin Bed with Storage! This is one of the most practical beds for toddler girls around. 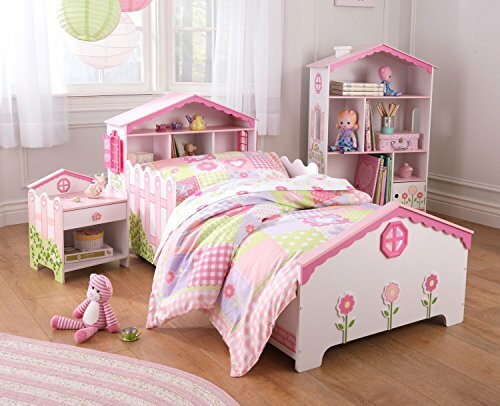 It is a very cute pink and white toddler girl bed with storage! Parents absolutely love kids beds with storage! This fun toddler bed will help you keep your little one’s bedroom nice and organized! It fits little girls ages 2 to about 8 years old and it has over 28 cubic feet of storage space! Perfect to keep their cute bedrooms nice and organized but keeping the adorable! 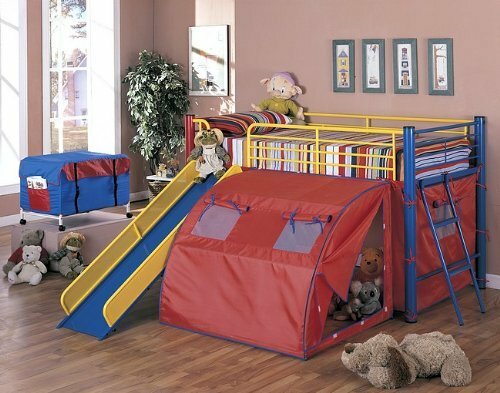 *What a Fun Bunk Bed with Slide and Tent! This is one of the most fun beds for toddlers and small children ever created!! It’s practically a full playground in the bedroom! It has a cool slide and a tent! Kids love to wake up and ‘slide down’ their bed! Getting out of bed in the morning has never been more fun! It is also very solid. Kids are gonna love playing “in bed” for hours and hours on a row! What a fun and useful gift idea! Pink Loft Castle Bed for Girls! You won’t believe this castle-shaped beds for kids! These are the most unique beds for kids ever created! Now they can have their own castle! They will never want to leave! This is the ultimate, cutest and most unique bed for girls on this planet! 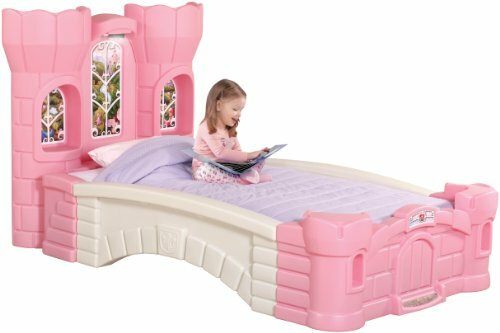 Their very own pink princess castle bed with a slide! Can you imagine her excitement when she sees her ‘new bed’? I swear to God, if they made one for adults it would be my bed too! Look at that awesome slide! And the fun play area underneath! You will never have to tell her it’s time for bed again! Off to my pink castle! Cute and Colorful Lalaloopsy Twin Bed for Little Girls! The Most Fun Beds for Toddlers! Look what I just came across!! 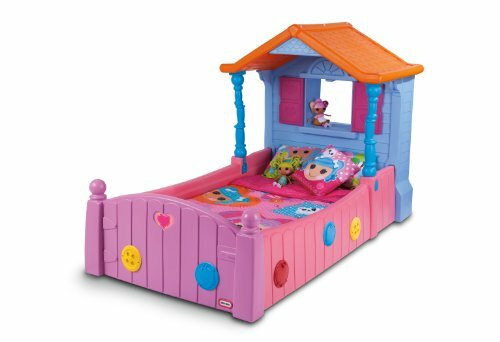 It’s the most adorable and colorful Lalaloopsy bed!! Is this the most fun bed for toddler girls or what? It is an awesome fun twin bed toddlers and small girls up to 5 years old. It will make an incredible gift idea for some very lucky girl in the family! She can place her own Lalaloopsy dolls on the cute “window” just like in the picture! I love the cute details too, such as the buttons and cute hearts! *Fun Boat Shape Bed for Toddlers! 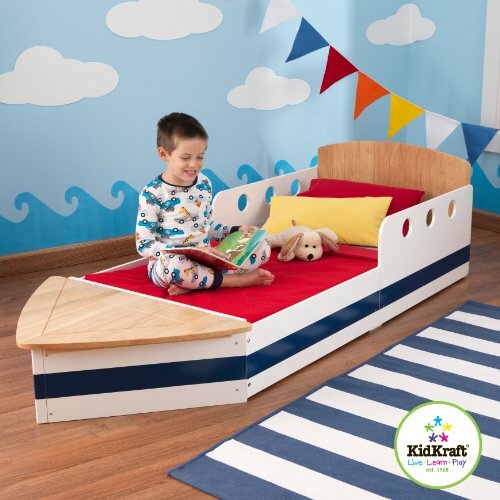 Very creative and fun boat shape bed for kids! They are gonna LOVE sleeping on their very own ‘boat’ at night! You can use it to create a cool ‘pirate theme’ or ‘out in the sea’ decor! Adorable KidKraft Dollhouse Toddler Bed! And I will end my selections of cool beds for toddlers today with this sweet and adorable dollhouse bed for little girls! She can place her favorite dollies on the headboard and have the most wonderful, magical dreams every night! AMAZING BUNK BEDS for KIDS!